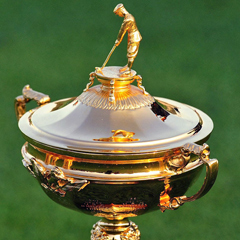 Cape Town - The 2032 Ryder Cup will be played at the Olympic Club in San Francisco, the PGA of America has confirmed. The historic California course will be the venue as the biennial tournament heads back to the west coast of America for the first time since 1959 when it was played as Eldorado in Indian Wells. The Olympic Club has previously staged the US Open five times, and will also play host to the PGA Championship in 2028. The Olympic Club’s Lake Course last staged a major in 2012, when Webb Simpson held off Graeme McDowell and Michael Thompson to win his maiden US Open title by one shot. Following the announcement, PGA of America president Paul Levy said: "This is a special moment for our Association, to return the PGA Championship and the Ryder Cup to the west coast. "We're excited to showcase The Olympic Club and its Lake Course, and combine them with the many tastes, sights and sounds that make San Francisco and the Bay Area so distinct." The next Ryder Cup in the US in 2020 will be held at Whistling Straits in Wisconsin, while to 2024 edition will take place at Bethpage Black in New York. A venue for the 2028 edition has yet to be confirmed.